Ray Olmedo slides into third, safe, 29 July 2014. We missed the broadcast intro last night. But it sure looks like the Tampa Bay Rays’ indecision/secretiveness as they approach the trading deadline cost the Bulls a game last night. How was that? Well, Merrill Kelly started the game and, while we think the world of Mr. Kelly, it hardly seems fair to put him up against the best hitting team in the IL in a hitter-friendly park when he has not started game since 28 June. Since then he’s has only thrown 90 pitches over 4⅓ innings in five relief appearances. Nevertheless, Kelly did just fine if it weren’t for the two home runs. He was followed by his colleague Doug Mathis who did not let another run in, although he did provide some thrills with his 3 Ks. The larger question is why the Bulls, who are already short a reliever in the bullpen (Jeff Beliveau was never replaced) had to use one of them to start a game? A plausible answer is that the Rays may be about to do some trading and want maximum flexibility. So who’s up tonight? Yes, the Bulls did have their chances, but the Rays made it tough on them. 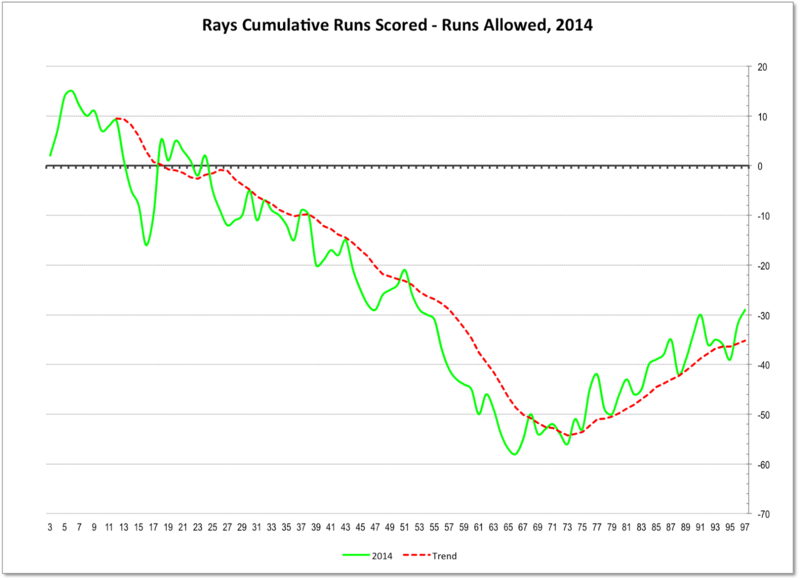 WDBB got 15 seconds of fame the other day when one of our charts got posted on the Rays Index. Big deal in the blogging world. 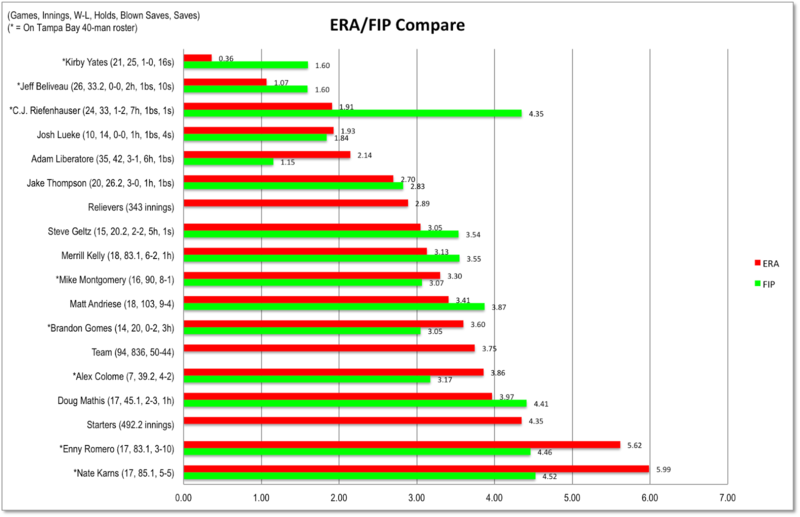 The Process Report, another Rays blog, has taken a look at WDBB favorites Kirby Yates and Jeff Beliveau, who are now with the Rays. Isn’t that a nice shot of Ray Olmedo? Beautiful night for baseball at the DBAP. Not too hot, not too steamy. Well-matched teams. Seems like the 7th inning made all the difference. Mike Montgomery was looking much better than in his awful start down in Gwinnett on the 20th. However, the Mud Hens’ Robbie Ray was looking pretty good himself. Jeremy Moore had muscled an opposite-field home run over the Monster in the 6th to tie the game and Montgomery was up with just 86 pitches thrown. Too many? Hard to say. As a practical matter, no one was warming up. Montgomery walked the first batter, who stole second base and came home as the go-ahead run on a solid single to centerfield. That brought in Adam Liberatore, who had only allowed one of his 17 previous inherited runners to score — by far the best on the team. So although the Mud Hens were ahead by one with no outs it didn’t look impossible to catch up. But a bizarre bunt single that went out into right field put runners on first and third and the runner on third scored before Liberatore could put out the fire with two ground outs and a K. Should Montgomery have started the 7th? Probably not. Ain’t hindsight wonderful? Vince Belnome's pretty shot, also opposite field over the Monster, would not be enough. Let’s celebrate the Bulls homers though, by Vince Belnome and Jeremy Moore. Let’s continue to worry about Hak-Ju Lee, who does not seem to be improving this last month either at bat or in the field. 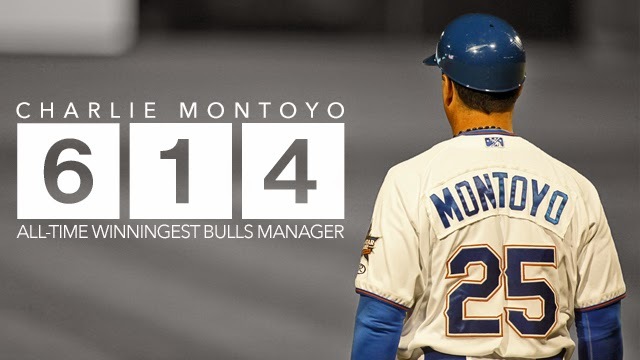 Terrific essay on Charlie Montoyo’s record-setting career as Bulls manager in the program notes for this series. Worth coming to the game to get a copy. Nice ceremony after the game honoring Charlie. Nice to see wife and children out there with him. 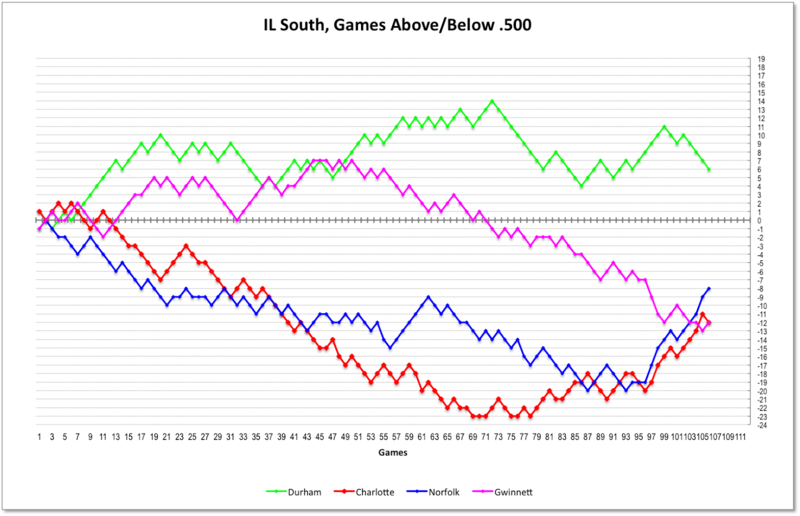 Don’t look now, but there’s been a complete turnover in the IL South Division. Norfolk and Charlotte have both put together winning streaks, Norfolk rising to 2nd place and Gwinnett dropping into last place in just the last few days. Looking back to a game a year ago, July 25, 2013, some interesting names pop up in a Bulls-Braves game. Notice the surprising number at the beginning of this post. Only 19 home games left! Where did the season go? In spite of a couple of homers, Bulls hitters have not been doing well lately. This is the game-by-game team wOBA (weighted on-base-average) of the last 20 games. It’s the trend that matters. 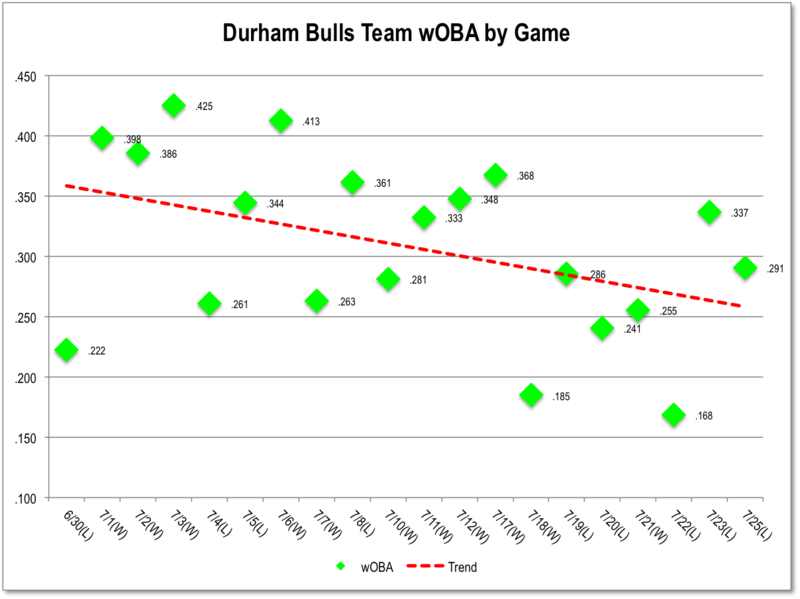 As for what it means, let’s just say that the descriptors for wOBA include terms such as “average” for .320 to “awful” for .290, which is where the trend is below after last night’s game. In other words, it ain’t looking good these days. We should have known that it was a doomed effort from the start. After all, that’s what all the weather predictors were saying. Nevertheless, the tarp was pulled in time for the game and we drove through thunderstorms to the DBAP, getting there one inning late. That meant we only saw a couple of innings of baseball before the tarp came back on. At that, though, the Red Wings were hitting Alex Colome pretty well. Worrisome. The Bulls are going to try to finish the game while they are up at Rochester next month. The Toledo Mud Hens seemed to have sorted themselves out until they arrived in Norfolk four days ago. But then they lost four in a row and are coming in to Durham in 3rd place in the West. [standings] Statistically, the Mud Hens and Bulls are not that far apart in any department. Possible Bulls starters for the four game series are: Mike Montgomery, Enny Romero, Matt Andriese, and Nathan Karns. The Pythagorean Expectation computation attempts to translate runs scored for and against into win and losses. So if you were to run the PE equation as we went along this season, here’s what you would get. Now, the question is, how come the Bulls are doing better than their expectation? The most likely answer is the bullpen. 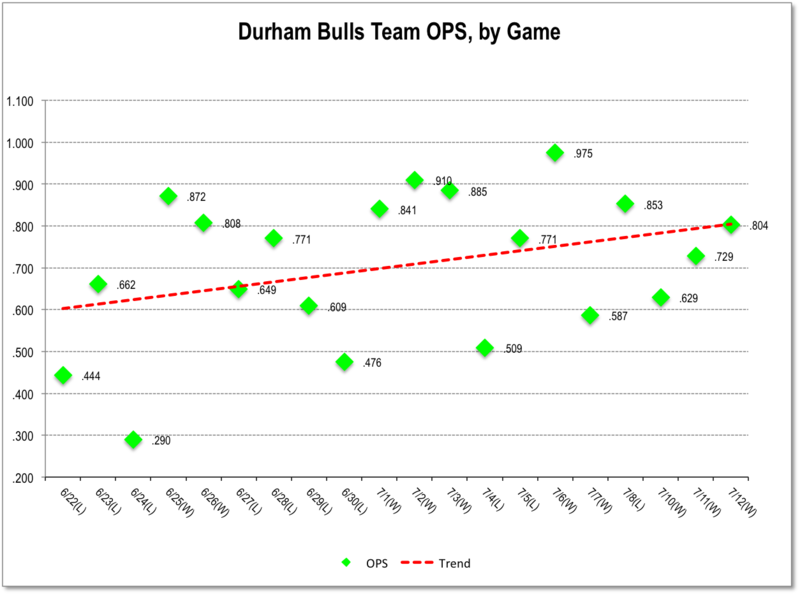 The Bulls overall ERA is nothing special. At 3.57 they are 4th in the IL. But the relievers’ ERA is 2.86, pretty special. 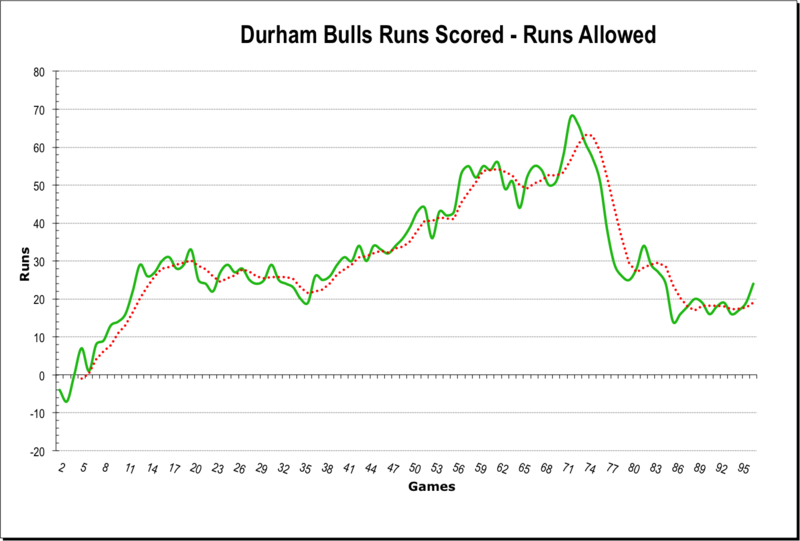 Otherwise, something of a mystery, and something to worry about if the Bulls cannot score runs to push their expectation up. It takes runs to win a game, and the Bulls are not as good at that as some of their competitors. That 2nd inning was just ugly. Doug Mathis came on after Mike Montgomery had managed only four outs, let 6 runs in, and had 2 runners on base. Mr. Mathis has become this year’s sacrificial goat. He goes off to “extended spring training” or “Hudson Valley” when roster room is required. He comes back after the Rays have raided the Bulls. He usually comes in for long, very long, relief situations, often when the game is already out of hand. Is he any good? Hard to tell. All things considered, his line of 18 appearances, 49 innings, with an ERA of 4.22 isn’t bad at all. After Mathis’ 3 innings, a couple of pitchers who haven’t thrown in a game since before the All-Star break got some time in: Riefenhauser and Kelly. Adam Liberatore wrapped up a lost cause. Not a game for the Bulls to be proud of, though. Tonight is the first time that the Durham Bulls have seen the Minnesota Twins’ Triple A team, the Rochester Red Wings, this year. After this four-game home series, the Bulls will play them again in the middle of August for their last out-of-division games before the end of the season. The Red Wings are doing very well in the tough North Division of the International League. In fact, if the season ended today, they’d be the Wild Card team for the International League playoffs. The Red Wings lead the Bulls in every key statistical category listed, so the Bulls will have their work cut out for them over the next couple of days. And there’s the very distinct statistical oddity of their Pythagorean Expectation being so far off from their actual. That implies a lot of games lost by low scores, and games won by very big scores. Let’s hope that they don’t start balancing that out tonight. 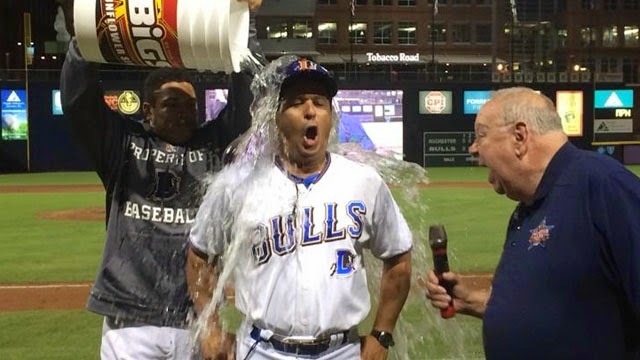 It's well beyond the actual midpoint of the season for Triple-A (that was back on June 15, game 72) and yet a psychological midpoint and several days off for most of the Durham Bulls. The game started out with a wonderfully familiar sequence: runners on 1st and 2nd (Justin Christian and Vince Belnome), and Jeremy Moore doubled in two runs and the Bulls never looked back. WDBB’s favorite starting pitcher of 2014, Matt Andriese, was on the mound and threw a stellar 7⅔ innings backed up by 5 (count ‘em, 5!) double plays. Everyone but Robby Price and Vince Belnome got hits and they both got on base with walks. The quirky stat (other than all the double plays) is probably the fact that they scored 7 runs on only two extra base hits (doubles by Moore and Mahtook. This was the first shutout by Bulls pitching since June 9th. Catcher Curt Casali has been called up to the Rays. This will be the young player’s first time in the major leagues and the Rays will be doing some razzle-dazzle with the 40-man to make it happen. The callup was because Rays' catcher Ryan Hanigan will go on the 15-day disabled list, but outfielder Wil Myers is going on the 60-day disabled list to make room. Not sure that we’ve mentioned that Jerry Sands, a terrific hitter who started the season with the Bulls, is likely out for the rest of the season after being called up to the Rays and then being injured. Along those lines, have not heard a thing about injured infielder Tim Beckham in a long time. We’ve been waiting for ground ball inducing pitcher Matt Andriese to pitch before putting up this link. In it blogger Cork Gaines speculates that the Rays don’t particularly like ground ball pitchers in their stable because the artificial turf down at Tropicana Field makes turning double plays difficult. To be honest I’m not sure the analysis holds up, but if it does it looks like a terrific young pitcher for the Bulls might not have a future with the Rays. 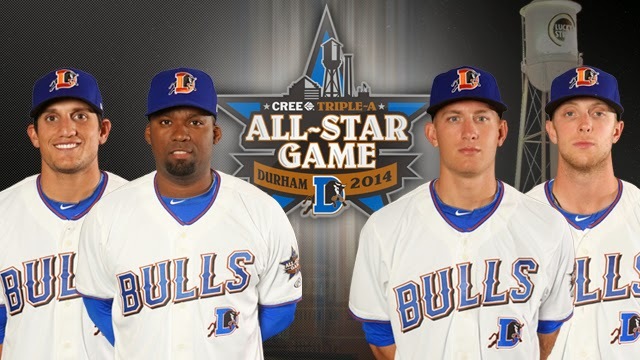 The Bulls begin their post-All-Star season at 53-44, 9½ games ahead of Gwinnett in the South Division. [standings] If the playoffs were to begin today, the Bulls would face a first round playoff series against the Columbus Clippers or Indianapolis Indians (they are tied in the West) while Syracuse (North) and Rochester (Wild Card) would be playing each other. This upcoming series could be Gwinnett’s last, best chance to climb back into contention. The net runs scored/runs allowed chart shows a bit more dramatically the problems in June and the stabilizing and modest recovery since then. 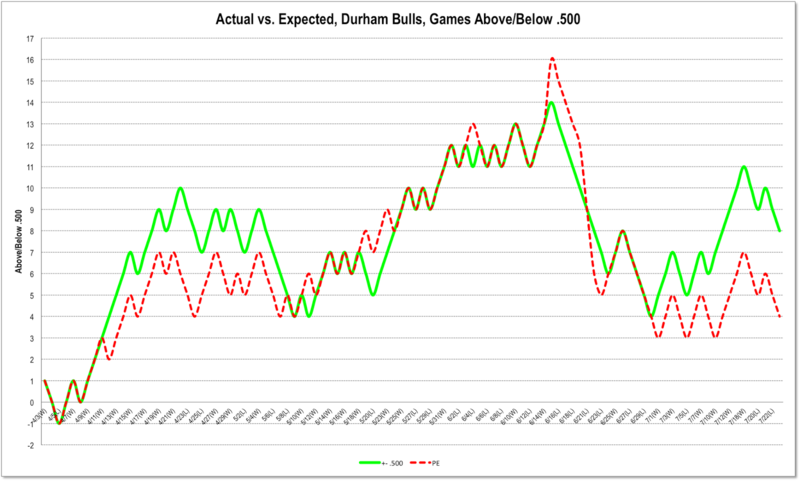 The Bulls' Pythagorean Expectation is 51-46, that is, they are doing better than expected. Conventional wisdom attributes that to relief pitching. That certainly appears to be the case as far as the Bulls are concerned. This cumulative ERA chart shows the huge slippage in starting and relief pitching in June and then shows how it stabilized a bit overall (and improved among the relievers) in recent days. 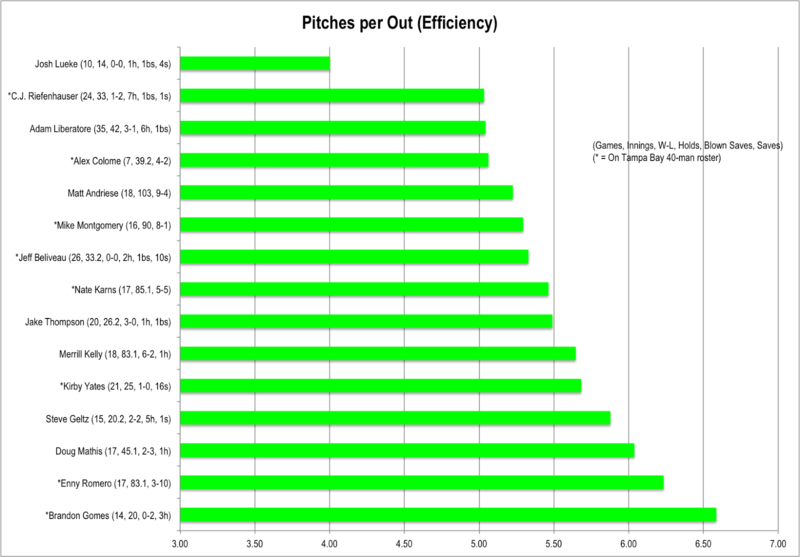 See our recent post on individual pitchers here. 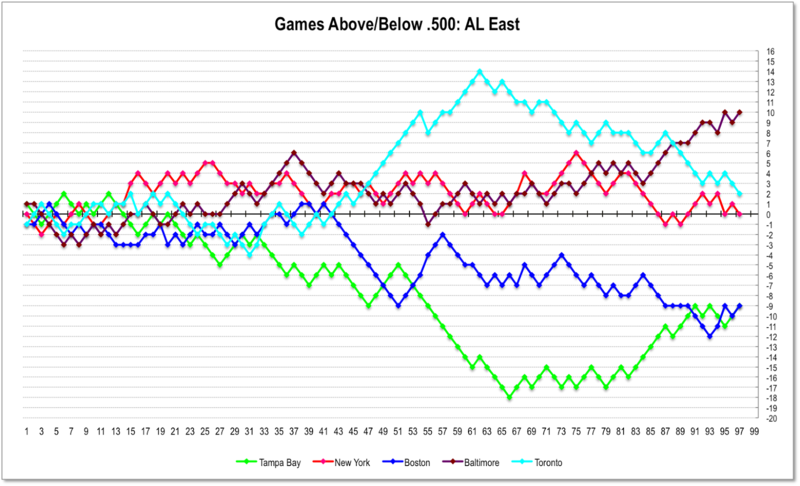 If you take the last 20 games, figure the team OPS for each game, and slap a trend line on it, it looks like this. Pretty good trend, even if the absolute numbers are nothing special. Since we’ve got the numbers, how about our friends down in St. Petersburg? They are tied for last place in the American League East. And have a pretty dismal net runs scored chart. But looking better in recent days. At 44-53 they are doing worse than their Pythagorean Expectation of 46-51. Again making their bullpen suspect. No surprise there. On the other hand, when they reached their nadir for the season back in mid-June I commented that they would be doing well to reach .500 on the season. Here’s a chart that implies that if they stay on track they could reach that goal. Regular readers will know that we are not yet fans of young Nathan Karns. To see why, take a look at our charts from a couple of days ago. But give credit where it’s due. He had a fine night last night going 7 innings and only letting in 1 run. There’s hope. On the other hand, how about Jeremy Moore? Yet another game-winning home run! Then, just for grins, his last at-bat featured three pitches that went inside, inside, and even further inside. Those pitches brought Charlie Montoyo down to the plate to get between Moore and the ump. As it turned out, Moore hit a very sharp grounder to first for an out. But seemed to me to be kind of pointless on the part of the Bison’s pitcher. Reliever Jake Thompson has been put on the disabled list for an unspecified reason. Thompson has made 20 appearance since coming up from Montgomery and has done a good job over his 27 innings. Doug Mathis returned from Hudson Valley to take his spot on the roster. 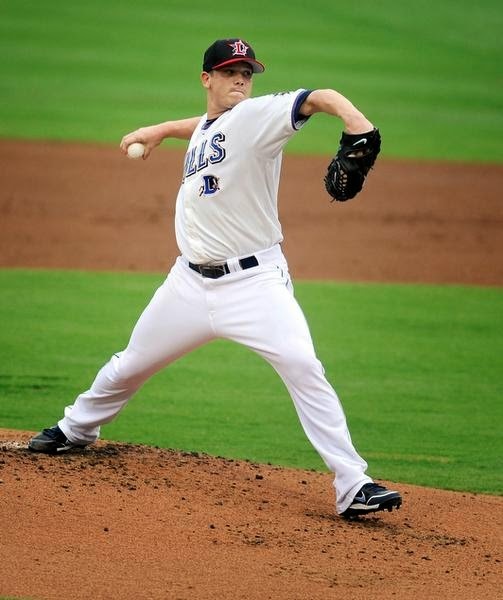 Former Bull Dan Johnson was called up to the Bisons’ parent club, the Toronto Blue Jays, and went immediately into the lineup against the Rays last night. He drew four walks and scored three runs (including the winning run). That’s what DJ does — draws walks or hits home runs. The first thing to know about the Buffalo Bisons is that their first baseman is Dan Johnson. Johnson stands very high on the list off all-time great Durham Bulls hitters. He was a Bull in 2008, and was back for 2010 and 2011. He is #2 on the all-time list when the list is sorted by OPS. We should note that a hitter could not even get on the list without at least 1,000 plate appearances with the Bulls. He’s having more than a decent year with the Bisons. He leads the International League in home runs and is 4th in OBP and OPS. According to broadcaster Patrick Kinas there were persistent rumors last night that he was about to be called up to the Blue Jays. If so, that would really mess up the Triple-A Home Run Derby, where we were going to be able to see him and Mike Hessman square off for a championship (although doesn’t seem quite fair since Hessman bats right and Johnson is a lefty). DJ went 0-3 with a walk last night. The second is that the minor mystery of Mike Montgomery has not been cleared up, but he did have a decent outing. Mystery? Well, it’s this. Back on June 14 he pitched 5 innings in an 88-pitch no-decision. Then he did not pitch again until June 23, another 5 inning no-decision, where he threw 77 pitches. His next appearance was not until July 4, also 5 innings, throwing 76 pitches. Stated another way, he only made three starts after his June 9th win, and pitched only 15 innings for 3 no-decisions. Why? Unless I missed something, as usual, the Rays aren’t saying. As Bulls fans, let’s just say that his win last night was welcome. Not that he was all that sharp, but he did reach 92 pitches even though they all came in just 5 1/3 innings. My guess? Rotation turmoil with Hellickson around and a desire to give him some rest. Is he back? Not sure. He did not look all that sharp on the TV last night. Meanwhile the game was won by — who else? — Jeremy Moore, who smacked a 2-run homer that drove in Justin Christian. Christian had another great night as well with three hits and scoring two out of the three Bulls runs. As we know, Wednesday’s game in Norfolk was rained out. So was yesterday’s against Gwinnett. Wonder why? 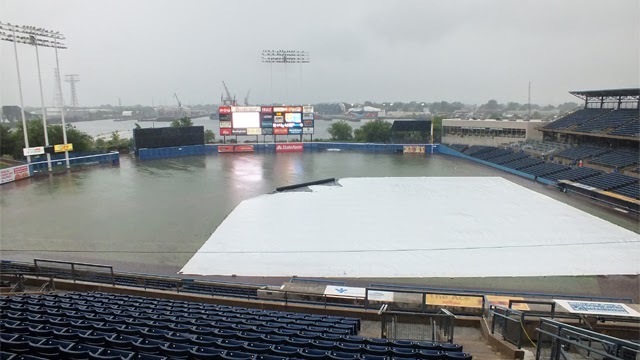 Here’s what Harbor Park looked like yesterday. After tonight the Bulls will not play another game in the DBAP until July 21. That’s 13 days without seeing the Bulls play at home. We will not be without baseball, of course, but it will only (only!) be the All-Star Game on July 16. This will be the longest stretch without a home Bulls game this entire season. What to do? Well, we could go to a Mudcats game. The Cleveland Advanced A team will be home on July 11-14. Or drive over to Burlington to take a look at the Kansas City Royals Rookie League team the Burlington Royals, who will be home from July 9 to 14. Or combine a trip to the mountains with a couple of games in Asheville, watching the Asheville Tourists. The Single A team of the Colorado Rockies will be playing at home July 8-9 and 15-17. In between here and the mountains you’ve also got the Greensboro Grasshoppers and the Winston-Salem Dash (both Carolina League Teams). Lastly, if you’re headed to the beach, there’s the Wilmington Sharks (Coastal Plain League, wooden bat collegiate league), July 11-12 or the Wilmington Blue Rocks, Single A, Royals July 11 thru 14. This has not been a year for big guns, but Wilson Betemit and new(ish) guy Jeremy Moore are making noise recently and they both got homers last night. 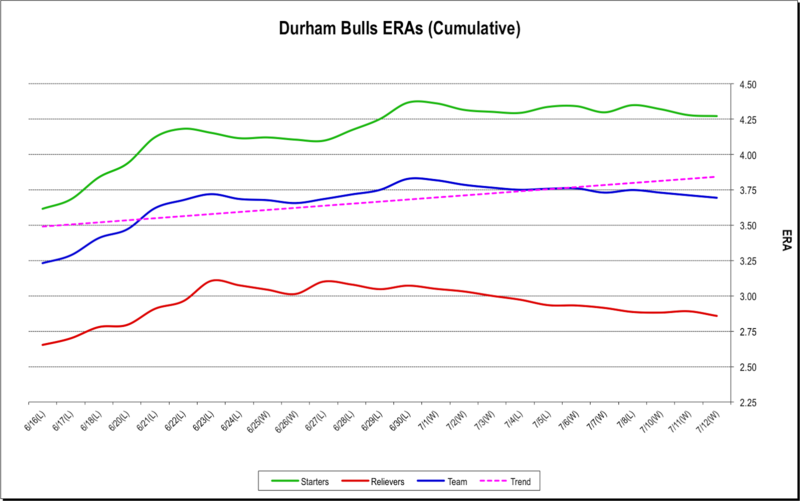 The Bulls only have 65 home runs on the year (6th in the league), and even though that is hardly a good measure of a team (Charlotte with the worst won-loss numbers in the league has the most home runs) it is still nice to fun to see the ball sail out of the park. Jeremy Hellickson is to start a game Tuesday with the Tampa Bay Rays. Guess that means he won't be back in a Bulls jersey next week. 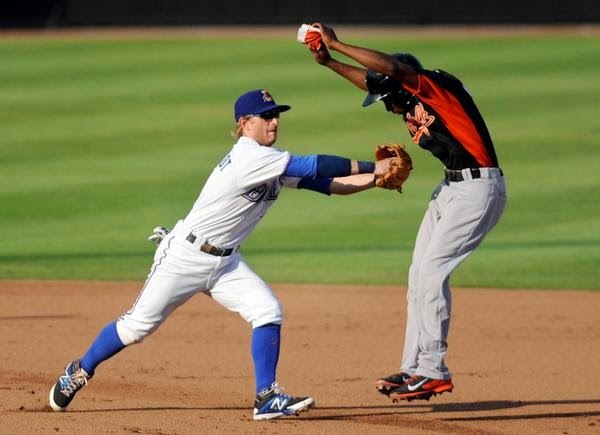 Vince Belnome and Jeff Beliveau are being sent back to the Durham Bulls. Belnome got in one game as a designated hitter and went 0 for 3. Beliveau did not throw a pitch during his visit this time. Cole Figueroa remains with the Rays. He's been in 3 games this visit, 8 plate appearances, no hits. As Bulls fans what we want to see are pitchers who don’t lose control of the game. 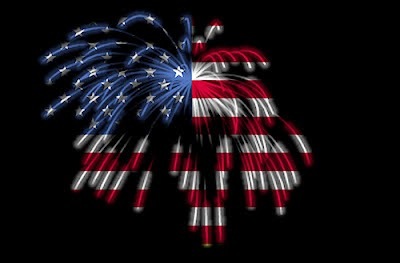 That’s what we saw last night. It wasn’t the champion we were seeing back in 2010, but Jeremy Hellickson seemed to have a grip on things. Of course, in the stands we are never quite sure what’s really going on in circumstances like this. For example, Hellickson seemed to be throwing a lot of off-speed stuff. Was that because that was his (and Solis’ and Acosta’s) read of the situation or was it because that was his goal for the game, to work on his curveball? We will never know. The important thing is that he stayed in the game and got his first win for the Bulls. If I were a Rays fan I’d have to say that Hellickson does not look quite ready, although that does not necessarily mean that he won’t be showing up on the mound for the Rays on his next start. He is on the same schedule as Rays’ starter Bedard (who began season with Bulls) who had a really bad night last night. 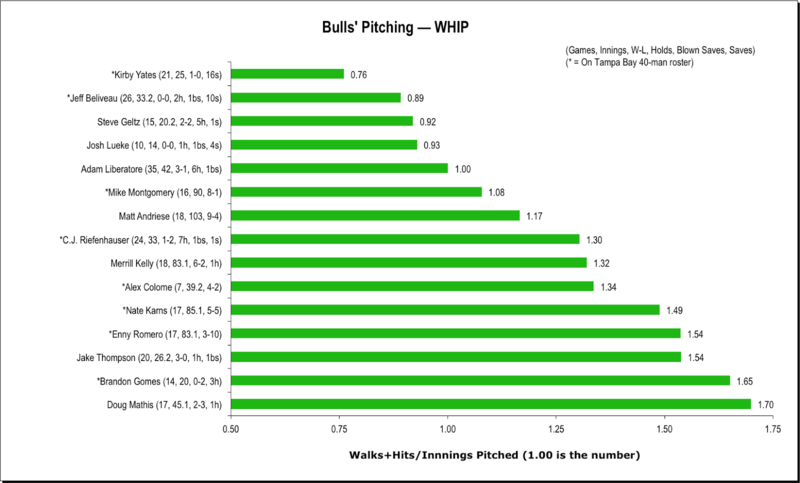 Outside of watching Hellickson show off that he’s not really a Durham Bull by wearing his long trousers, it was a fun night with every Bull getting a hit except for Mike Fontenot and activated-for-the-day Mayo Acosta. But even Fontenot got into the act in the 7th. In what sure looked like a tactical error on the part of the Braves, Fontenot came to bat with runners on 2B and 3B and was given an intentional walk to get at Mikie Mahtook, one of the top hitters in the league. Yes, there was just one out, but Mahtook drove in a run as did Jeremy Moore who followed. Gotta love Justin Christian’s work over these two games. Big hits, big plays in right field. Catcher Ali Solis’ got a finger on his right hand mashed when he attempted a bunt in the 2nd inning. He tried again and ran out a bunt single. He ended the inning on 3rd base and put on the gear to start the 3rd, but apparently he could not hold a grip on the ball. Mayo Acosta, who had been activated when Vince Belnome went up to the Rays, was already in his gear and came into the game. Wonder what effect that has on a pitcher to have his catcher changed on him? Interesting piece in the New York Times on how dominant the pitchers are this year. Then there’s a foghorn-voiced fellow selling peanuts who at least once a game somehow succeeds in evoking a call and response from youngsters in the crowd. Great fun to listen to. Herald-Sun’s paywall does not seem to be up (or maybe isn’t working). Nice summary of Jeremy Hellickson’s career as a Durham Bull by Harold Gutmann today. 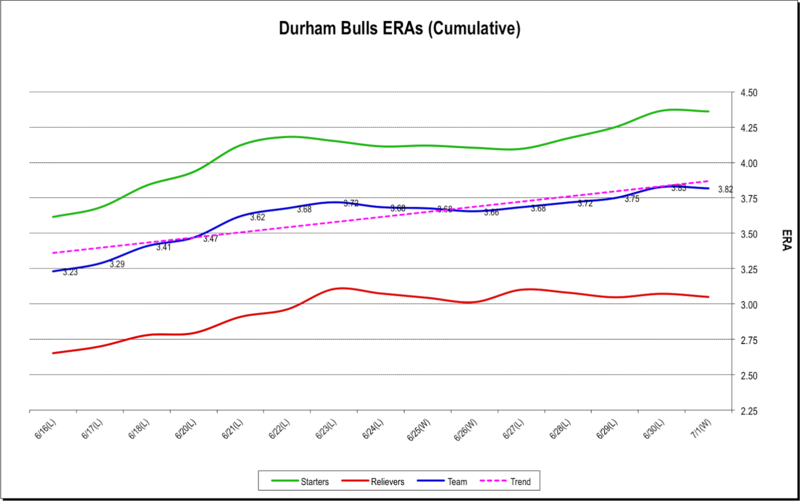 The worrisome Durham Bulls come back to Durham for a short two-game visit in the midst of a tough stretch that began back on the 16th of June up in Louisville when the Bulls were 14 games above .500 and 7½ games ahead of Gwinnett in the South Division. Since that time the Bulls have lost 12 games and won just 3 (including last night). 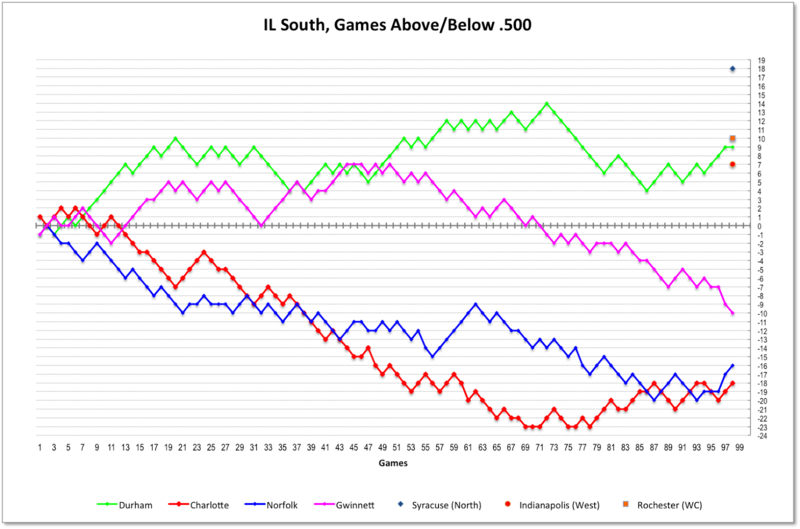 Fortunately for the Bulls' standings in the South, the Gwinnett Braves have not been doing much better and the Bulls are still 5 games ahead of them. What’s gone wrong? Mostly starting pitching, as the chart of the running totals of ERA over the last 15 games shows. Matt Andriese's work last night was the exception. And maybe, just maybe, Hak-Ju Lee’s bat has come to life. Lee went 3 for 4 including a home run, for what was, I think, his best one-game performance this year. Andriese gave up two home runs (to the same guy, Pawtucket’s Corey Brown), but otherwise seemed in control. Alex Colome has been optioned back to the Bulls after a fine performance for the Rays against Baltimore. Jeff Beliveau has been called up. Speculation is that he won’t stay long, but that the Rays may come looking for a position player. At the moment, only Hak-Ju Lee, Ali Solis, and Vince Belnome are on the Rays 40-man. 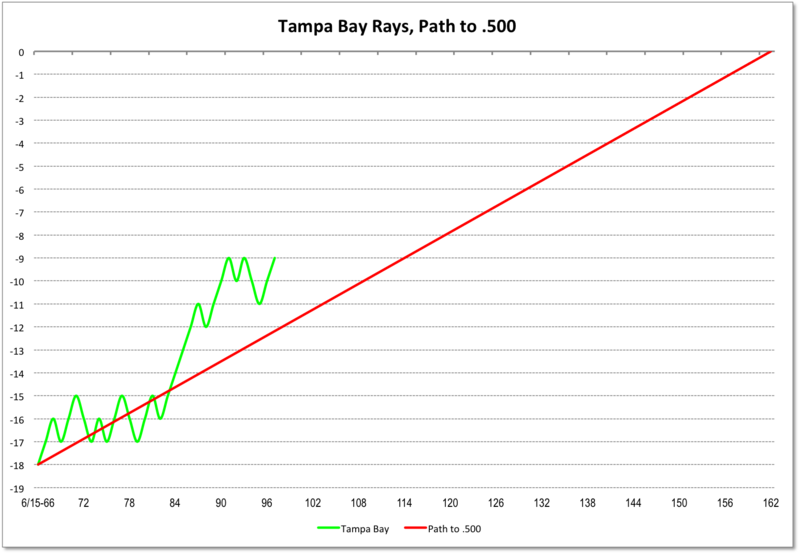 But the Rays are past masters at manipulating that, so hard to tell if someone will be moving up soon. Gwinnett has been having a tough year, but nothing wrong with their hitting. If the Bulls pitching does not get in order, this could be a difficult series for the home team.